The middle class remained historically weak last year, according to Census Bureau numbers released today, as it continued to feel the effects of a decades-long slide driven in part by the decline in union membership across the country. Last year, the middle class’s share of the nation’s total income remained stagnant at its lowest point since these data were first reported: The middle 60 percent of households took home only 45.7 percent of the nation’s income in 2012, the same percent it took home in 2011 and well below the 53.2 percent it used to take home in 1968. Between 1967 and 2012, nationwide union membership fell from 28.3 percent of all workers to a low of 11.3 percent, with significant drops observed in all 50 states. This trend has been mirrored by the steady decline in the share of the nation’s income going to the middle 60 percent of households, which fell from 52.3 percent to 45.7 percent over the same time period. According to the newly released Census figures, neither measure showed any signs of reversing these troubling trends last year. 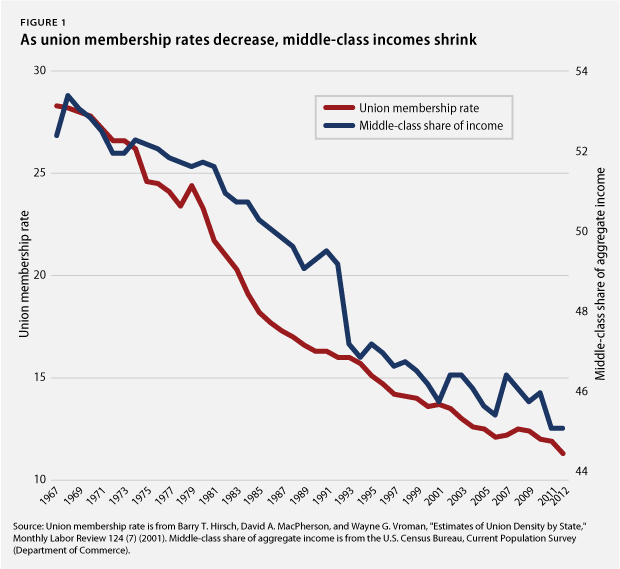 Between 2011 and 2012, union membership declined even further, by 0.6 percentage points, while the middle class’s share of national income remained stagnant at 45.7 percent, its lowest level since data were first reported. Meanwhile, the share of national income going to the top 5 percent has only increased. Last year, it stood at 22.3 percent, up from 17.2 percent in 1967. Last year’s measure equals the second-highest level recorded since the Census Bureau began keeping track of the figure 45 years ago. These figures make clear that if the middle class is to get back on its feet and become the engine of economic growth it once was, unions will have to play an important role in its revival. By standing up for middle-class interests both in the workplace and in the political arena, unions help grow the ranks of the middle class and ensure that all working families’ voices are heard. The most direct manner in which unions work to strengthen the middle class is by advocating on behalf of their members for fair pay, access to essential benefits, and basic workplace protections. Workers who form a union are able to negotiate with their employers on a more even playing field and are more likely to have their concerns and suggestions recognized. Indeed, research has repeatedly shown that being in a union substantially increases workers’ wages and significantly improves workers’ likelihood of having pensions and health care coverage. And when union density is sufficiently high in an area, the benefits that unions bargain for can help set standards for other employers, which can benefit nonunion workers as well. Unions also work to bolster the middle class via the political process by encouraging greater worker participation in politics and by advocating for economic programs that help working families get ahead. Unions help increase voter participation by enlisting members in registration and “get out the vote” efforts, and they have fought in the past to defend programs essential to the middle class, such as Social Security, the minimum wage, and most recently, the Affordable Care Act. By helping workers navigate the political process and by lobbying on their behalf, unions help ensure that democracy works for the middle class. Unfortunately, the latest Census figures further underscore just how poorly the middle class is faring, as unions are increasingly unable to fill these vital roles due to political attacks on workers’ rights to organize and declining union membership rates. But while these negative trends remain serious causes for concern, there are sources of optimism in the current labor landscape. 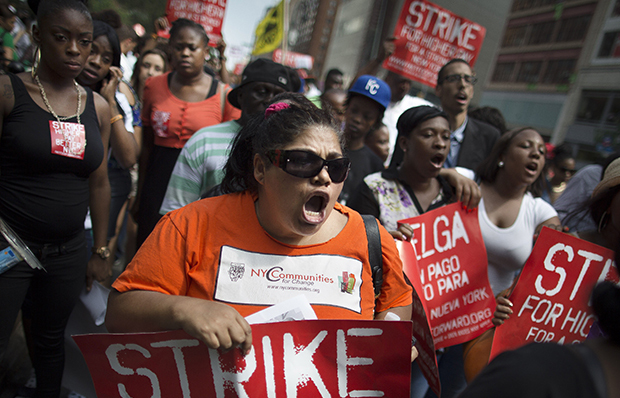 Just last month, fast-food workers launched their largest-ever strike for higher wages and better working conditions, with workers from nearly 1,000 franchises taking part in more than 50 cities nationwide. These strikes are gaining widespread attention and support, suggesting that people are increasingly fed up with the twin trends of declining union membership and a dwindling middle class. Similarly, a number of other unconventional efforts to bring more people into the labor movement are showing promise. As movements like these gain momentum and more attention is focused on the important role that organized labor must play in rebuilding the middle class, hopes for reversing the trends of the past several decades can only grow. A vibrant labor movement is necessary to ensure that both our economy and democracy work for the middle class. David Madland is Director of the American Worker Project at the Center for American Progress Action Fund. Keith Miller is a Research Assistant with the American Worker Project.